Prosecutors say Cesar Sayoc had been planning the "terrorist attack" since July. The man accused of mailing more than a dozen pipe bombs to prominent Democrats, other high-profile liberal figures and CNN had been plotting the "domestic terrorist attack" for months, prosecutors said. The FBI searched electronic devices belonging to the suspect, 56-year-old Cesar Sayoc, and discovered files containing the addresses of his intended victims, as well as return labels that match those used on the padded mailing envelopes carrying the improvised explosive devices (IEDs), according to a letter from prosecutors sent Tuesday to the judge presiding over Sayoc's case in Florida. "The defendant conducted a domestic terrorist attack targeting at least 15 victims," Geoffrey S. Berman, the United States Attorney for the Southern District of New York, wrote in the letter to U.S. Magistrate Judge Edwin Torres of the Southern District of Florida. "Metadata from the electronic devices indicates that the defendant started planning the attack as early as July 2018." 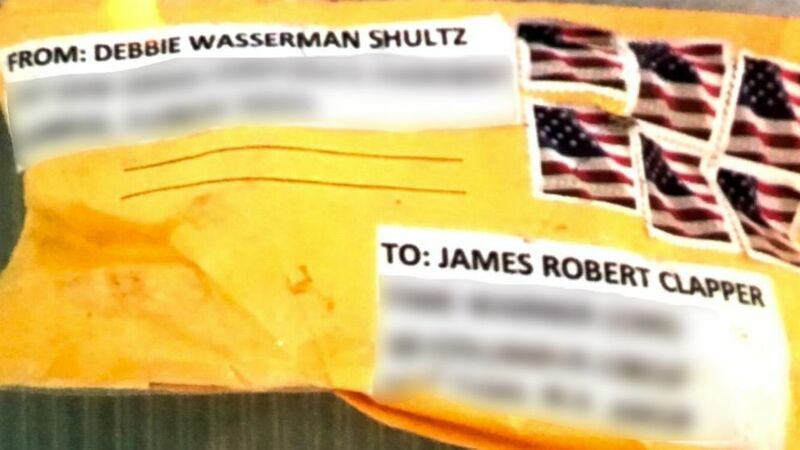 A document created on Sayoc's laptop on July 26 contains repeated copies of the return address in Sunrise, Florida, that was used on the parcels as well as the name of Democratic Rep. Debbie Wasserman Schultz. Moreover, the internet search history on Sayoc's cellphone reveals he was looking for the home address of former Secretary of State Hillary Clinton as far back as July 15, according to the letter. Other files from Sayoc's laptop also contained addresses for "numerous additional targets," and the FBI is warning each of those individuals, the letter states. "The evidence of the defendant’s terror campaign is still being collected but is already overwhelming," Berman wrote. "Put simply, only the defendant's arrest and incapacitation resulting from his detention were sufficient to stop his attack." Put simply, only the defendant's arrest and incapacitation resulting from his detention were sufficient to stop his attack. Berman requested that the Florida resident be transferred to New York to "face the consequences of his actions" and urged that he remain behind bars pending trial "due to both his dangerousness to the community and risk of flight." "There are no conditions that could adequately protect the public from the defendant and assure his appearance in Manhattan for trial," Berman wrote. 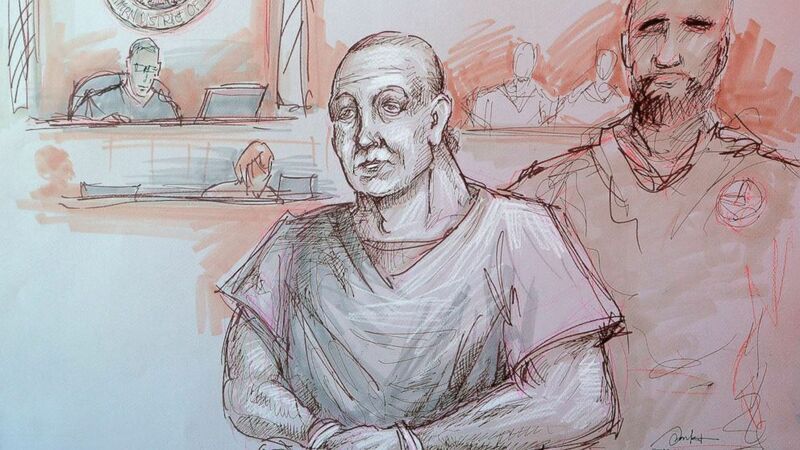 (Daniel Pontet via AP) In this courtroom sketch, Cesar Sayoc, left, appears in federal court, Monday, Oct. 29, 2018, in Miami. 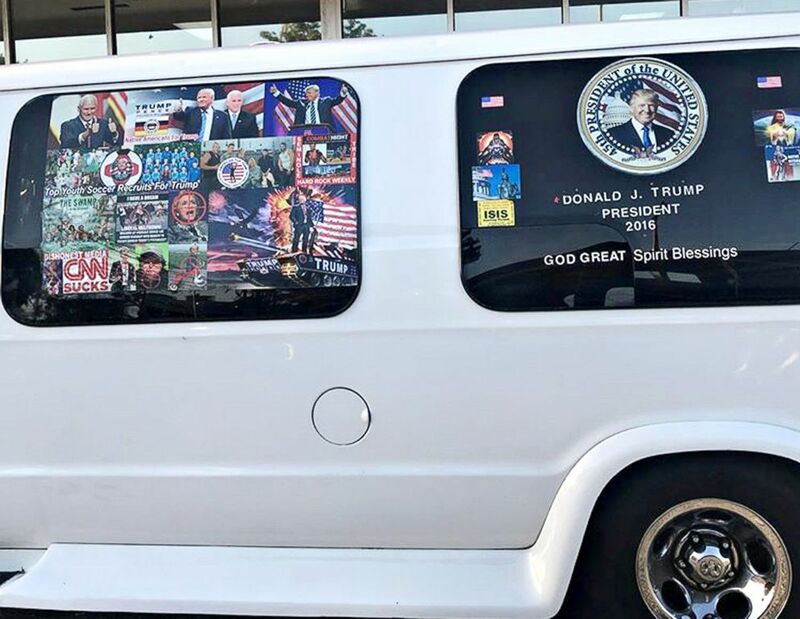 Sayoc could be sentenced to up to 48 years in prison if convicted of the five federal charges he's facing: interstate transportation of an explosive, illegal mailing of explosives, threats against former presidents and certain other persons, threatening interstate communications, and assaulting current and former federal officers. His attorneys did not immediately respond to ABC News' request for comment Wednesday. 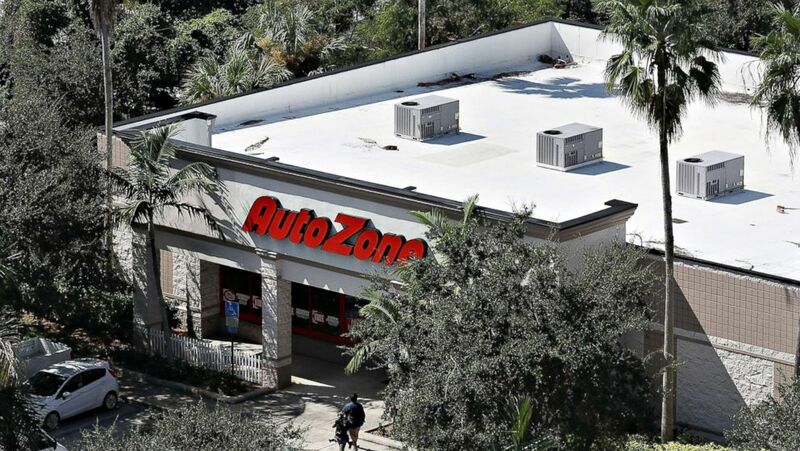 ( Joe Raedle/Getty Images) The AutoZone at 801 S. State Road 7 where Cesar Sayoc, a 56-year-old man from Aventura, Fla., was arrested in the possible connection with pipe bombs being mailed to critics of President Donald Trump on Oct. 26, 2018 in Plantation, Fla.
Investigators were able to compare a fingerprint from one of the envelopes sent to a Democratic congresswoman and compared it to a sample collected from one of Sayoc's previous arrests in Florida, according to FBI Director Christopher Wray. 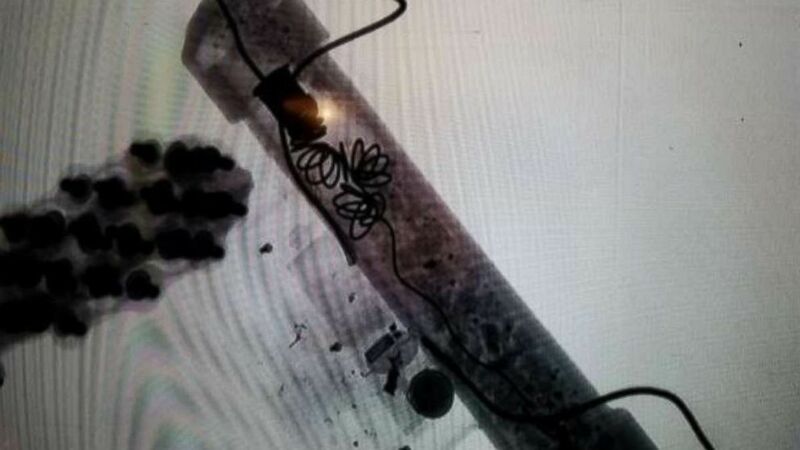 Sayoc's DNA was also found on some of the wires used in the IEDs, according to law enforcement officials. "We do believe that we caught the right guy," Wray said at a press conference Oct. 26. One of Sayoc's attorneys told ABC News after Monday's court appearance that the fingerprint and DNA evidence is "in question" and requires a complete forensic analysis. (Justin Lane/EPA-EFE/REX/Shutterstock) Police officers outside of a post office where another suspicious package was discovered and removed by the New York Police Department's bomb squad in New York City, Oct. 2018. "These are not hoax devices," Wray said at the Oct. 26 press conference. The packages and the contents were all sent for analysis to FBI's laboratory in Quantico, Virginia. "The FBI's analysis of the defendant's IEDs is ongoing, but it is clear that they were dangerous," David Brown, FBI special agent, wrote in the Oct. 26 complaint against Sayoc. "The IEDs that have been analyzed thus far contained energetic material with explosive qualities. The defendant also placed shards of glass in several of the IEDs for the apparent purpose of maximizing harm to his intended victims through the detonation of the devices that he had mailed." The series of mailed explosives first came to light on Oct. 22 with the discovery of a package containing an IED that was delivered to the home of billionaire philanthropist George Soros in Westchester County, New York. Inside the parcel was also a photograph of Soros marked with a red "X," according to court documents. 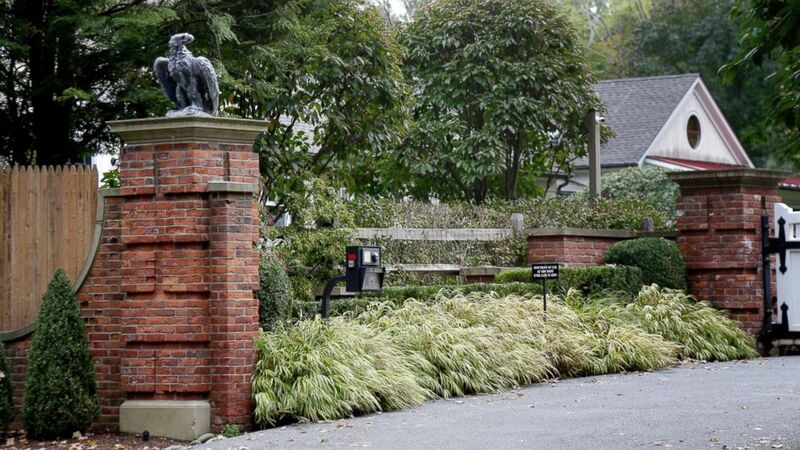 (Seth Wenig/AP) The entrance to a house owned by philanthropist George Soros is seen in Katonah, N.Y., a suburb of New York City, on Oct. 23, 2018. A device found outside the compound "had the components" of a bomb, including explosive powder, a law enforcement official said Tuesday. The following day, a package addressed to Hillary Clinton containing an IED was intercepted by the Secret Service at a screening facility before it reached her home in the New York City suburb of Chappaqua, also in Westchester County. Hillary Clinton, speaking at a campaign event in Florida on Oct. 24, said, "We are fine, thanks to the men and women of the Secret Service who intercepted the package addressed to us long before it reached our home." A package addressed to former President Barack Obama containing an IED was intercepted by the Secret Service early Wednesday morning before it reached his residence in Washington, D.C. Inside was also a photograph of Obama marked with a red "X," according to court documents. Later that morning, a package containing a IED was delivered to CNN's New York headquarters the Time Warner Center in Manhattan. It was addressed to former CIA Director John Brennan, though he is an NBC News contributor and has no public ties to CNN. Inside the parcel was also a photograph of Brennan marked with a red "X," according to court documents. 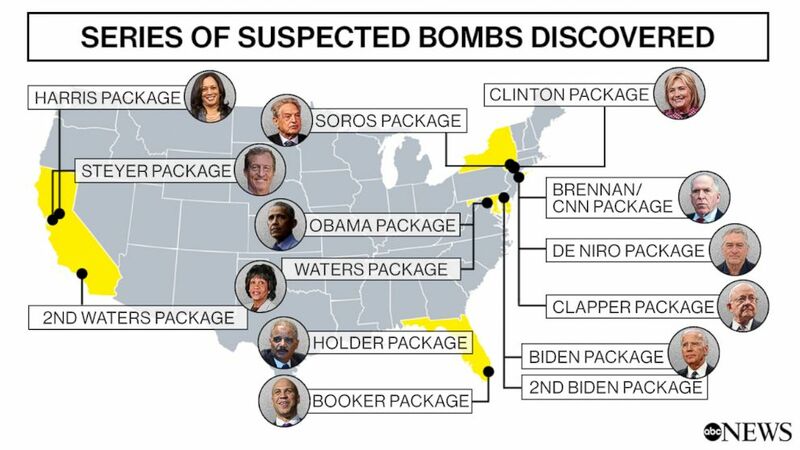 A package containing an IED was sent to former Attorney General Eric Holder with a return address for Wasserman Schultz. The parcel did not reach its intended destination and so it was sent to the congresswoman's address on Oct. 24. 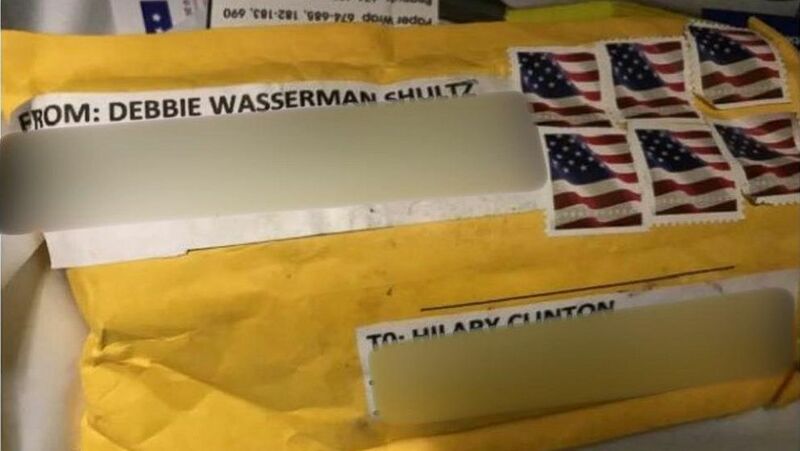 Investigators do not believe Wasserman Schultz was involved in sending any of the parcels. 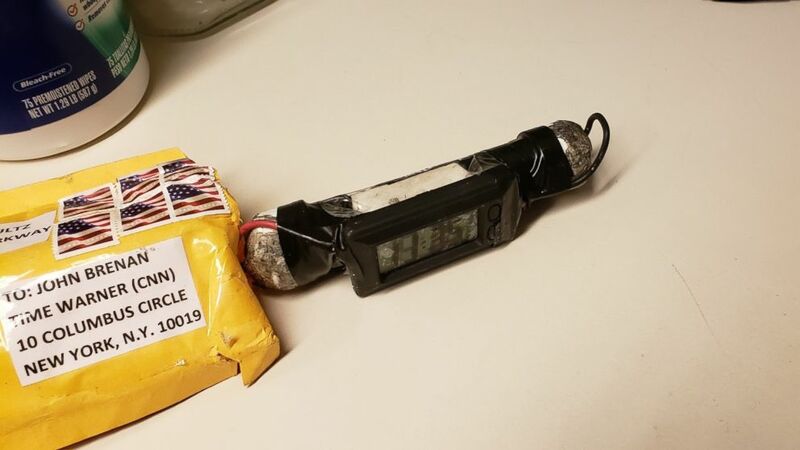 Two packages, each containing an IED, were sent to Democratic Rep. Maxine Waters of California at her offices in Los Angeles and Washington, D.C. At least one of the parcels discovered on Oct. 24 included a photograph of Waters marked with a red "X," according to court documents. A package containing an IED addressed to Robert De Niro was recovered from the actor’s Tribeca Productions film and television company on Oct. 25. A package containing an IED addressed to Democratic Sen. Cory Booker of New Jersey was recovered in the United States Postal Service's Royal Palm Mail Processing Center in Opa-locka, Florida, on Oct. 26. 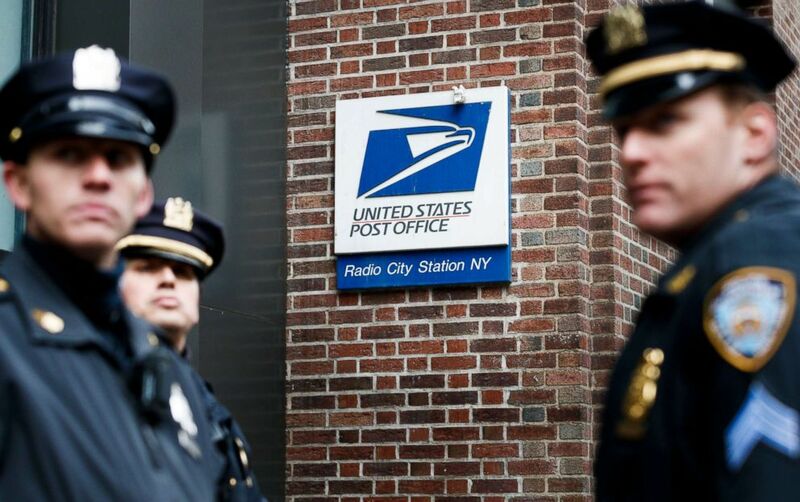 A package containing an IED addressed to former Director of National Intelligence James Clapper was then discovered at a United States Postal Service office in New York City. A package containing an IED addressed to Democratic Sen. Kamala Harris of California was recovered from a post office in Sacramento, California, on Oct. 26. On Monday, the day of Sayoc's initial court appearance, authorities recovered a fifteenth IED before it reached its intended target at CNN's office in Atlanta. 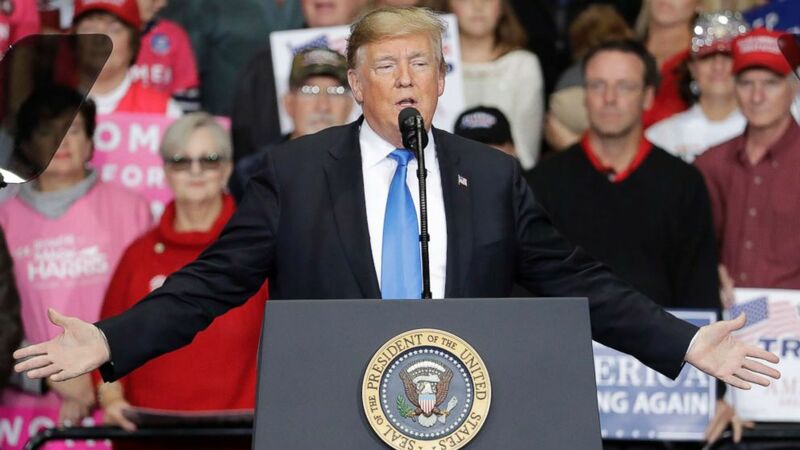 (Chuck Burton/AP) President Donald Trump speaks during a campaign rally in Charlotte, N.C., Oct. 26, 2018. Speaking from the White House on Oct. 26, Trump said the suspect will be prosecuted "to the fullest extent of the law." "The media has a major role to play, whether they want to or not," he said. ABC News' Mark Crudele, Jack Date, Katherine Faulders, Armando Garcia, Aaron Katersky, Mike Levine, Josh Margolin and Pierre Thomas contributed to this report.